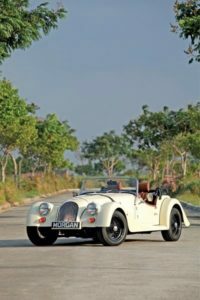 Driving aids are overrated, so we take the vintage-inspired Morgan Plus 4 for an exciting drive, free of computer control. Real driving excitement is endangered. 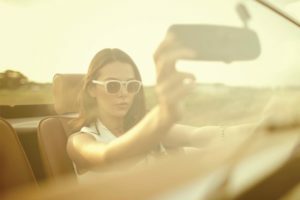 Many modern vehicles prohibit reckless abandon with the help of safety systems like motor-driven power steering, traction control, stability control, and ABS. In sportier vehicles, features like launch control, corner brake control, and torque vectoring compensate for all the fun that’s been taken away by safety imperatives—though always under the watchful eyes of the on-board computer. Yet, this illusion of control is no substitute for the connectedness and dash of unpredictability that old cars, bereft of modern safety systems, used to provide. Pure, unadulterated driving fun may be harder to find these days, but it’s far from extinct. One vehicle where it resides quite comfortably in is the Morgan Plus 4. The Morgan Motor Company, Ltd. was founded by Henry Frederick Stanley “HFS” Morgan in 1909. The railway worker left his job and designed and built a car for his own use. That very company continues to operate to this day, closely adhering to the founder’s ideals. Far from typical automotive companies that produced vehicles to reach production targets, Morgan pursued craftsmanship and performance in creating his vehicles. As a result, his first vehicle, a three-wheeler powered by a V-twin engine, offered little more than personal mobility and lower road tax, since it was classified as a motorcycle. In spite of competition from small cars like the Austin 7 and the original Morris Minor, the company soldiered on, eventually introducing the Plus 4, a four-cylinder, four-wheeled vehicle in 1952. 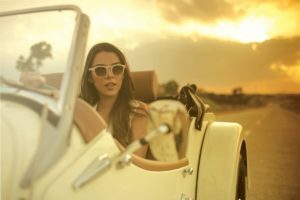 Morgan took its time introducing variants and new models in the years that followed, launching the retro-futuristic Aero in 2000 and the reincarnation of the Three-Wheeler in 2011. Nevertheless, the low production numbers allowed the company to focus on quality, craftsmanship, and excitement that the vehicles continue to be known for today. The beauty about Morgans is they’re built only after a customer has placed an order. This includes choosing from 40,000 possible colors and a dizzying array of upholstery and other options. Only then is the Morgan built, not by assembly line, but part by part. Wooden forms are stenciled, sawed, shaped, and joined to make parts of the car. Aluminum sheets are not stamped but hammered and molded over the wooden frames. Chassis are not moved by conveyor belt but rolled along on dollies. Vehicles are spray-painted by hand, not by a robot. Each component is fitted by hand, inspected and fixed if necessary. Finally, each vehicle is individually road tested to ensure they are worthy of being called a Morgan. In essence, Morgans are still constructed in the same way vehicles were built at the turn of the century. That fully manual process manifests itself in several parts of the car: the way the leather belt over the hood is frayed along its length, the beautiful welding marks along the windshield frame that are flattened but not erased, the imperfection in the stitching of the seats, letting you know it passed through caring hands. As for the drive, the Morgan is not perfect either, but it’s also uncensored. No traction control, ABS, or stability to save you from mistakes. This vehicle is not for the uninitiated. The throttle response is instant, with its precious burble resonated, not muted, by the muffler. The steering is slow, taking some turns to conquer a 90-degree turn. Yet it’s also this effort that helps you appreciate how hard cornering is. Or you can always let the back end come out and do more of the work for you. The transmission is short and crisp. After all, it’s sourced from a Mazda Miata. The ride is harsh, but nonetheless planted, giving better feedback on how slippery or sticky the road surface is. And, of course, there will be a lot of wind coming into the cabin, just to let you know how fast you’re going. All told, the Morgan is uncomfortable, twitchy, and a little bit scary. It’s clearly not an everyday car. But the few days you take it out, preferably on a twisty mountain road, will be the most exhilarating drives of your life. Driving excitement may be endangered but, quite appropriately, it takes a dinosaur like the Morgan Plus 4 to remind us why this freedom has become such a rare and exclusive treasure.